Splitting AV pipeline components into app-specific sandboxed processes. Enabling updatable media components (extractors, codecs, etc.). These changes also improve security for end users by significantly reducing the severity of most media-related security vulnerabilities, keeping end user devices and data safe. OEMs and SoC vendors need to update their HAL and framework changes to make them compatible with the new architecture. Specifically, because vendor-provided Android code often assumes everything runs in the same process, vendors must update their code to pass around native handles (native_handle) that have meaning across processes. For a reference implementation of changes related to media hardening, refer to frameworks/av and frameworks/native. This new architecture ensures that even if a process is compromised, malicious code does not have access to the full set of permissions previously held by mediaserver. Processes are restricted by SElinux and seccomp policies. Note: Because of vendor dependencies, some codecs still run in the mediaserver and consequently grant mediaserver more permissions than necessary. Specifically, Widevine Classic continues to run in the mediaserver for Android 7.0. 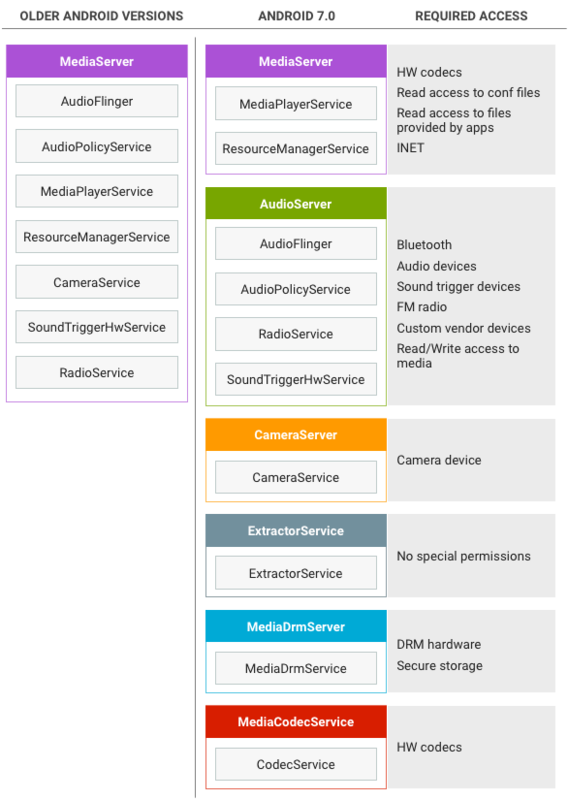 In Android 7.0, the mediaserver process exists for driving playback and recording, e.g. passing and synchronizing buffers between components and processes. Processes communicate through the standard Binder mechanism. Examines the file, creates the appropriate extractor for the file type (e.g. MP3Extractor, or MPEG4Extractor), and returns a Binder interface for the extractor to the mediaserver process. Makes Binder IPC calls to the extractor to determine the type of data in the file (e.g. MP3 or H.264 data). Calls into the mediacodec process to create codecs of the required type; receives Binder interfaces for these codecs. Makes repeated Binder IPC calls to the extractor to read encoded samples, uses the Binder IPC to send encoded data to the mediacodec process for decoding, and receives decoded data. In some use cases, no codec is involved (such as an offloaded playback where encoded data is sent directly to the output device), or the codec may render the decoded data directly instead of returning a buffer of decoded data (video playback). Non-secure decoders and software encoders live in the codec process. Secure decoders and hardware encoders live in the mediaserver (unchanged). An application (or mediaserver) calls the codec process to create a codec of the required type, then calls that codec to pass in encoded data and retrieve decoded data (for decoding) or to pass in decoded data and retrieve encoded data (for encoding). Data transfer to and from codecs uses shared memory already, so that process is unchanged. The DRM server is used when playing DRM-protected content, such as movies in Google Play Movies. It handles decrypting the encrypted data in a secure way, and as such has access to certificate and key storage and other sensitive components. Due to vendor dependencies, the DRM process is not used in all cases yet. The AudioServer process hosts audio related components such as audio input and output, the policymanager service that determines audio routing, and FM radio service. For details on Audio changes and implementation guidance, see Implementing Audio. The CameraServer controls the camera and is used when recording video to obtain video frames from the camera and then pass them to mediaserver for further handling. For details on changes and implementation guidance for CameraServer changes, refer to Camera Framework Hardening. The extractor service hosts the extractors, components that parse the various file formats supported by the media framework. The extractor service is the least privileged of all the services—it can't read FDs so instead it makes calls onto a Binder interface (provided to it by the mediaserver for each playback session) to access files. An application (or mediaserver) makes a call to the extractor process to obtain an IMediaExtractor, calls that IMediaExtractor to obtain IMediaSources for the track contained in the file, and then calls IMediaSources to read data from them. Using shared memory requires an extra Binder call to release the shared memory but is faster and uses less power for large buffers. Using in-Parcel requires extra copying but is faster and uses less power for buffers smaller than 64KB. 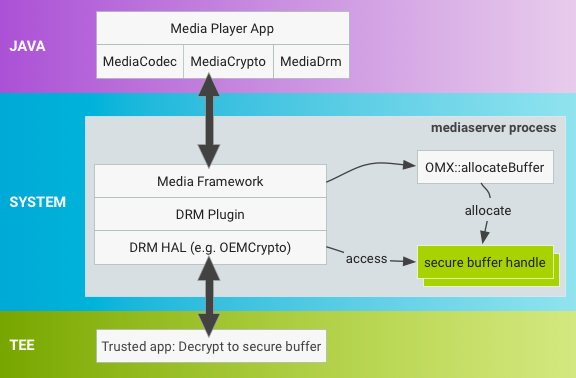 To support the move of MediaDrm and MediaCrypto components into the new mediadrmserver process, vendors must change the allocation method for secure buffers to allow buffers to be shared between processes. Figure 2. Android 6.0 and lower buffer allocation in mediaserver. In Android 7.0, the buffer allocation process has changed to a new mechanism that provides flexibility while minimizing the impact on existing implementations. 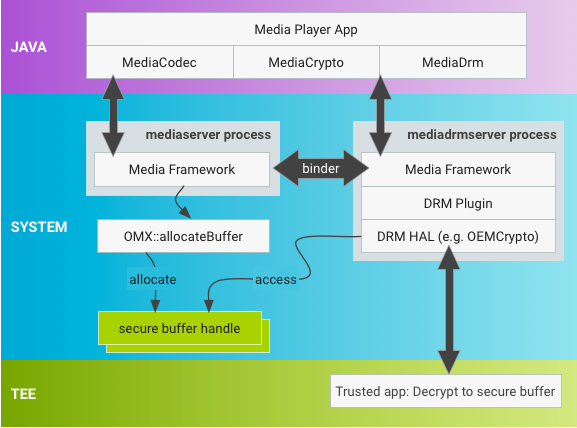 With MediaDrm and MediaCrypto stacks in the new mediadrmserver process, buffers are allocated differently and vendors must update the secure buffer handles so they can be transported across binder when MediaCodec invokes a decrypt operation on MediaCrypto. Figure 3. Android 7.0 and higher buffer allocation in mediaserver. The OMX::allocateBuffer must return a pointer to a native_handle struct, which contains file descriptors (FDs) and additional integer data. A native_handle has all of the advantages of using FDs, including existing binder support for serialization/deserialization, while allowing more flexibility for vendors who don't currently use FDs. Use native_handle_create() to allocate the native handle. Framework code takes ownership of the allocated native_handle struct and is responsible for releasing resources in both the process where the native_handle is originally allocated and in the process where it is deserialized. The framework releases native handles with native_handle_close() followed by native_handle_delete() and serializes/deserializes the native_handle using Parcel::writeNativeHandle()/readNativeHandle(). SoC vendors who use FDs to represent secure buffers can populate the FD in the native_handle with their FD. Vendors who don't use FDs can represent secure buffers using additional fields in the native_buffer. Vendors must update the OEMCrypto decrypt method that operates on the native_handle to perform any vendor-specific operations necessary to make the native_handle usable in the new process space (changes typically include updates to OEMCrypto libraries). As allocateBuffer is a standard OMX operation, Android 7.0 includes a new OMX extension (OMX.google.android.index.allocateNativeHandle) to query for this support and an OMX_SetParameter call that notifies the OMX implementation it should use native handles.